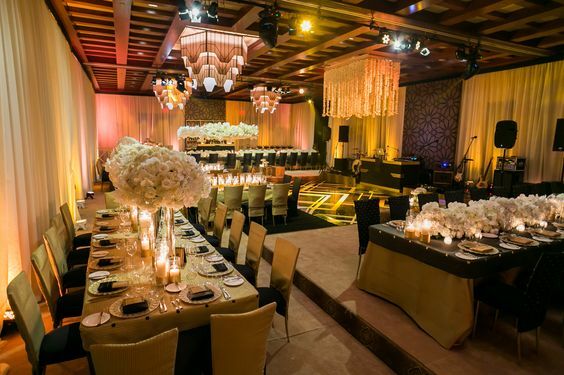 The final two events for Jasmin and Arshad were held at the Beverly Hills Hotel. 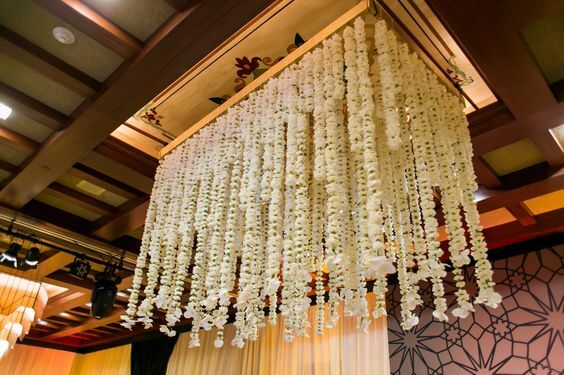 Jasmin had envisioned her ceremony to be very elegant in white complimenting the surroundings of the Crystal Garden. The hotel was able to accommodate our request to have the Baraat in the main driveway. Amidst all the pomp and circumstance, our baraat gathered on Sunset Blvd and the groom arrived on a horse accompanied by drums and dancers on the main driveway of the hotel. It was wonderful to see the driveway open to the hotel guests within the half hour period as the procession and rituals ended within that period. 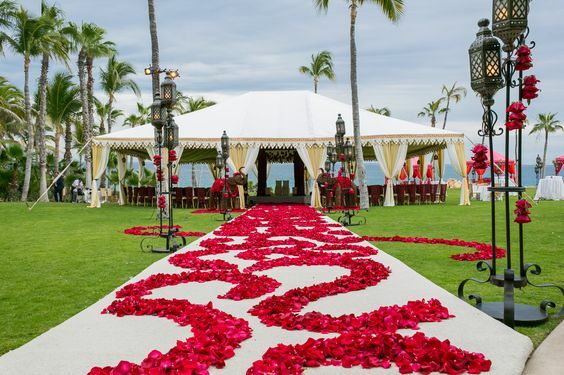 The ceremony ended on a high note with guests cheering for the couple. The couple was showered with lots of hugs, kisses and it was apparent how much they were loved. After taking photos with close friends and family, they exited the space. Have an Exquisite Day, and we'll see you next Wednesday for the grand finale of Jasmin and Arshad's wedding! The beautiful Marquesa Ballroom was booked for the Sangeet. We were in luck because the ballroom was available for setup the same day that we were setting up for the Bond event in the Contessa Ballroom. Because of the high ceilings in the Marquesa ballroom, Nikki wanted to bring a focal point and decided to hang upside down colorful umbrellas all over. Ethnic wooden bars with laser cut stained glass sat in two corners of the room under pergola tents. A large stage was set for the couple with a grand sofa in deep purple. The room was furnished in deep purple and bronze/gold furniture and colorful pillows. A few tables were scattered against the walls embellished with stunning linens and chair covers in green, turquoise and orange. Tons of colored glass candles sat atop tables and bars. The DJ was placed opposite the couple's stage in front of the large round gold dance floor. When the setup was complete, the room looked like a set from a fairy tale movie. Lighting created the most amazing mood and ambience. 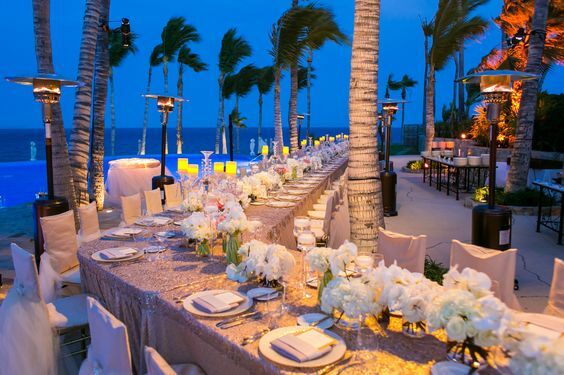 When guests entered the ballroom they were greeted by Samba dancers that had been flown from Las Vegas wearing exaggerated headdresses and beautiful costumes on the upper balconies. The movement simply created the most jaw-dropping atmosphere. Our couple made their entrance escorted by the Samba dancers amidst pomp and circumstance. The night had continuous entertainment provided by Indian dance troupes as well as several other companies and DJ. The bride had also arranged for glitter artist that kept the ladies busy with glitter tattoos. Indian food paid homage to both Sindhi and Gujrati heritage of Bride's and groom's families and was thoroughly enjoyed by guests. The dance floor was full the entire night while the DJ played tunes and guests danced the night away. The event ended on a high note with the couple paying utmost compliments and being over the moon at the outcome of event. There are two more weeks left of Jasmin and Arshad's wedding events, so stay tuned! Next week, the magical ceremony. Have an Exquisite day and see you next Wednesday! 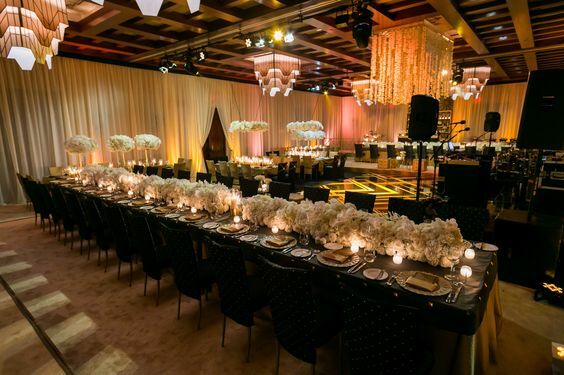 The following day was the Mehndi event at 12:00 p.m. Because the majority of the guests were staying at the Montage, all the event spaces were booked for various events. The Mehndi was going to take place at Scarpetta, which is a busy restaurant at the hotel. Our challenge was that we were only given access to the restaurant for setup the day of the event at 9:00 a.m. for a 12:00 p.m. call time. Our team was on standby and at 9:00 a.m. sharp, everyone moved in worked quickly to create a beautiful atmosphere in which to receive our guests before noon. 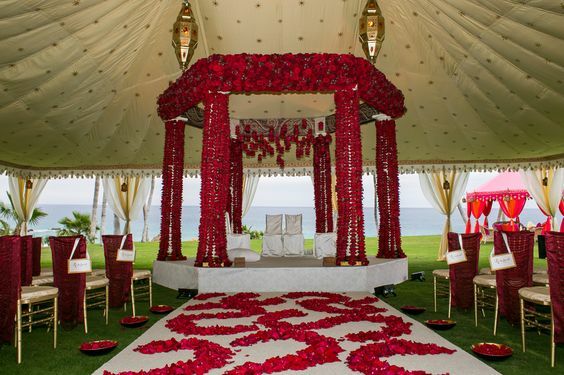 A stage was set atop which sat a gorgeous traditional sofa that had been converted into a swing for the couple. Saffron yellow and orange marigold garlands created the perfect backdrop for the stage while floating flowers in traditional hammered copper bowls sat on coffee tables and cocktail tables. Groupings of beautiful furniture vignettes in gold with Emerald green and orange pillows were placed all over the space. An antique armoire beating favors of sandals and bangles sat in a corner. Mehndi and caricature artists had a separate area to keep guests occupied. Special entertainment of traditional folk singers were flown from San Francisco to entertain guests endlessly with the DJ playing upbeat mehndi music in between. 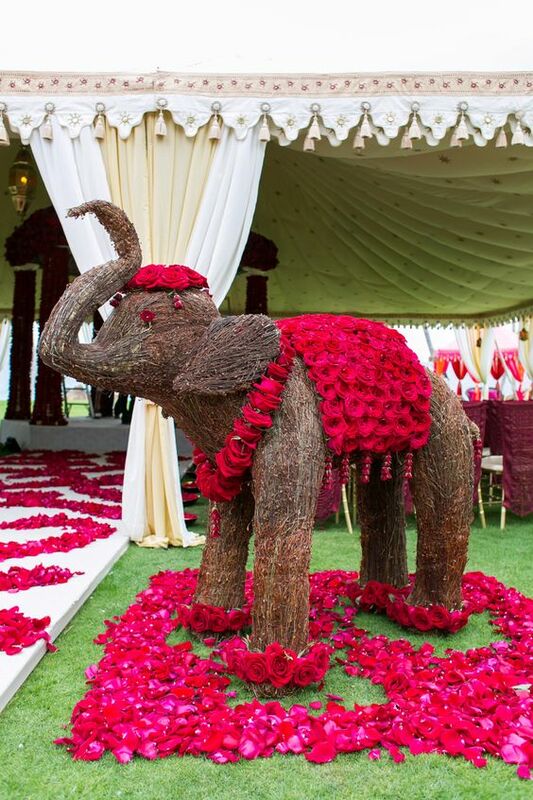 Our bride was a vision in a stunning Ankur Batra coral outfit with matching Blahnik shoes. She looked like quite a royalty sitting on the Jhula having bridal henna applied while her mom-in-law fed her lunch. Bombay Palace served delicious Indian fare of Bombay street food and amidst various customs, traditions, lots of dancing and fanfare the event ended late in the afternoon. Hope you loved these stunning Mehndi pictures as much as we did! Come back next week to read about the Sangeet! Have an Exquisite day and see you next Wednesday! Jasmin and Arshad met in Los Angeles where the bride was attending school. Her parents live in the Philippines, so this would be a destination wedding for the majority of the wedding guests. 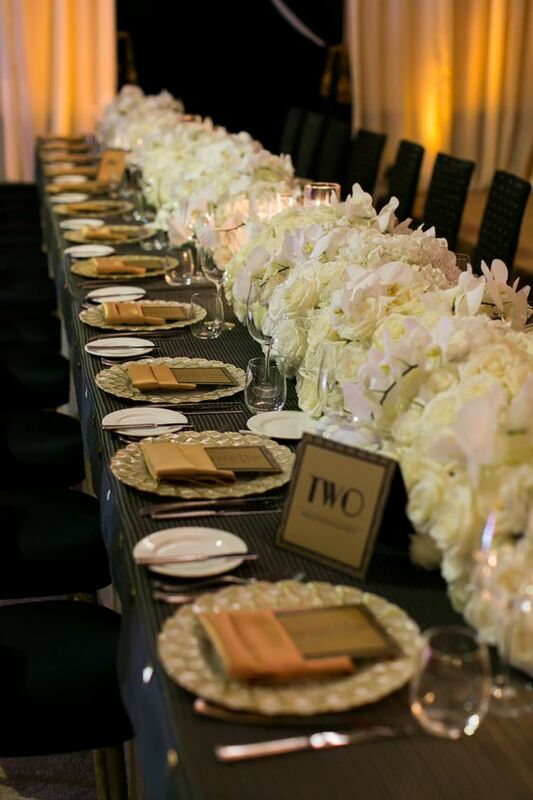 To accommodate the bride's family, multiple pre-wedding poojahs and events were booked at the Montage Beverly Hills. The ceremony and reception would take place at the Beverly Hills Hotel. Our couple Jasmin and Arshad decided to host a kickoff event for youngsters. Because the groom is a huge fan of James Bond, that was the theme chosen for this event. As soon as Nikki was informed about the theme she feverishly went to work pulling the elements to fit the James Bond theme. After several design meetings once all the elements were selected, a story board was created reflecting the pieces. The idea was for guests to feel they had entered a space that was reminiscent of an old James Bond movie. The foyer had a red telephone booth as well as a large 3D backdrop of London Bridge. Guests were greeted by a trio of electric violinists playing Bond music. Wrought iron furniture was placed in the foyer along the side wall. Our couple made quite an entrance looking very much like a dashing Bond couple with Jasmin wearing a stunning Alexander McQueen gown and Arshad looking handsome in a Tom Ford suit. The doors leading to the ball room had red and white striped awnings. Inside, the ballroom was completely transformed to look like a James Bond set. Distressed brown leather couches and chairs were placed around the room with coffee and end tables bearing deep red candles and flowers. Dozens of candle walls with hundreds of candles created a magical backdrop. Two custom wood bars flanked the back wall with a custom color bronze dance floor. One side of the ballroom had a casino set up with black jack, roulette and crap tables. 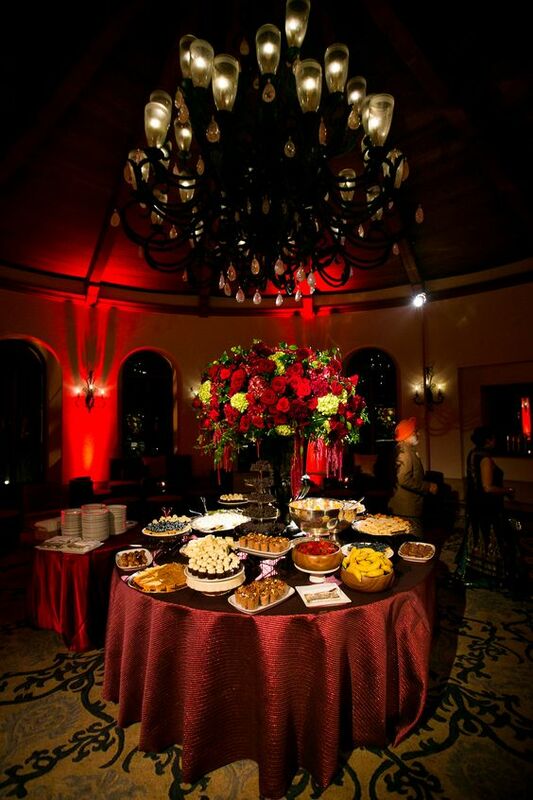 Under each chandelier a huge pedestal was placed for Bond girls to entertain guests. Revolving food stations served various English fare throughout the night and specialty martinis and drinks were served. The DJ spun Bond music and guests enjoyed the evening till the wee hours of morning. This was such a fun event for us to plan and attend! Stay tuned for Jasmin and Arshad's sangeet, ceremony, and reception in the weeks to come. Have an Exquisite day and we'll see you next Wednesday!